Homemade lasagna is one of my family’s favourite meals. 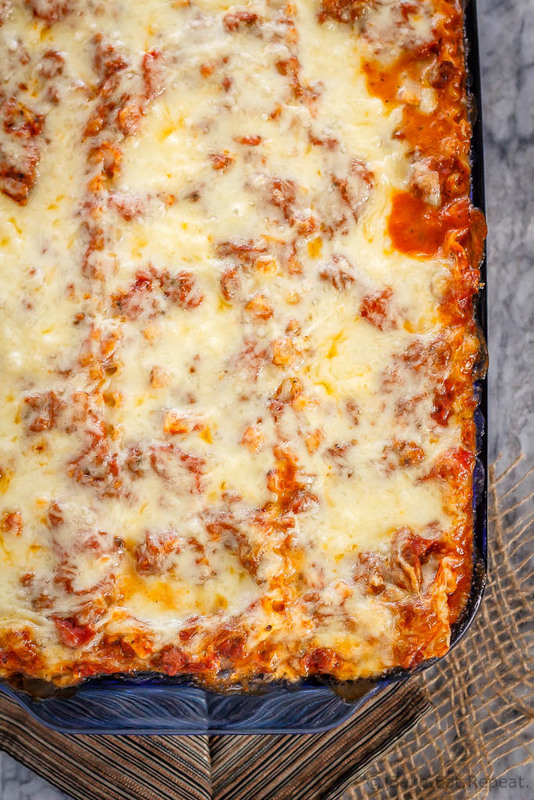 A thick and chunky meat sauce and lots of cheese, layered with tender pasta – perfect comfort food! Disclaimer: This post has been sponsored by Barilla Canada, and I have been provided with product and compensated for my time. All opinions are, as always, my own. It’s World Pasta Day today – so I am bringing you my all-time favourite pasta recipe! This homemade lasagna is my mom’s recipe, and it was always a treat when I was growing up. 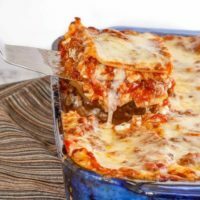 A thick and chunky meat sauce, lots of cheese, and tender noodles are layered together to make a big pan of cheesy comfort food. It is fast becoming one of my kid’s favourite meals too! My six year old ate his plate of lasagna so fast we were a little bit concerned he might make himself sick. I’m fairly certain he ate more then anyone else at the table (he’s the youngest!). He even requested it for lunch at school the next day. He was disappointed when it was all gone and he couldn’t have more the day after that! Yeah – he’s a fan. One of the things I love about lasagna is it’s versatility. It’s perfect as a weeknight family meal, but just as great for a Sunday dinner with company. It can also be made ahead of time and frozen for an easy meal in the future. I’ve tried many different brands of lasagna noodles, but this is the first time I’ve made it with Barilla’s noodles. Barilla pasta is known around the world for its high quality pasta. I am fast becoming a big fan. 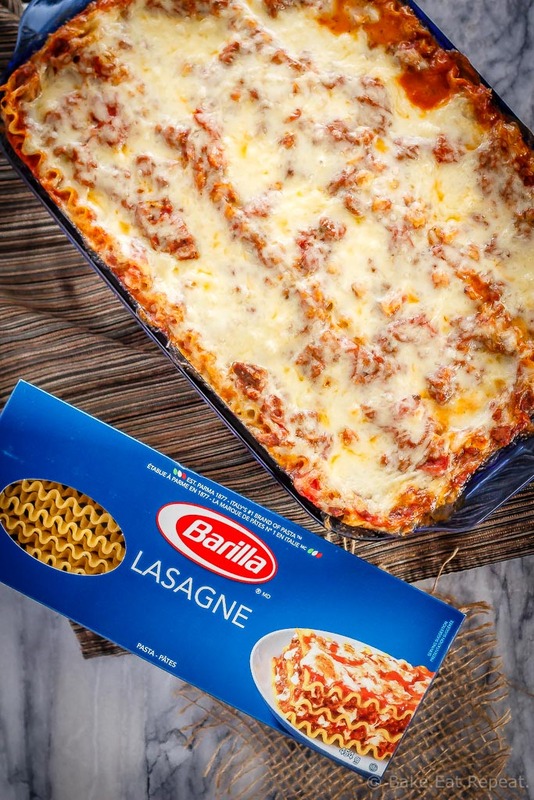 These noodles always cook perfectly al dente, and the lasagna noodles fit perfectly in a 9×13 inch baking dish! No cutting or breaking noodles to try and cover the dish, it’s just three noodles for each layer. Exactly. That made me really happy. 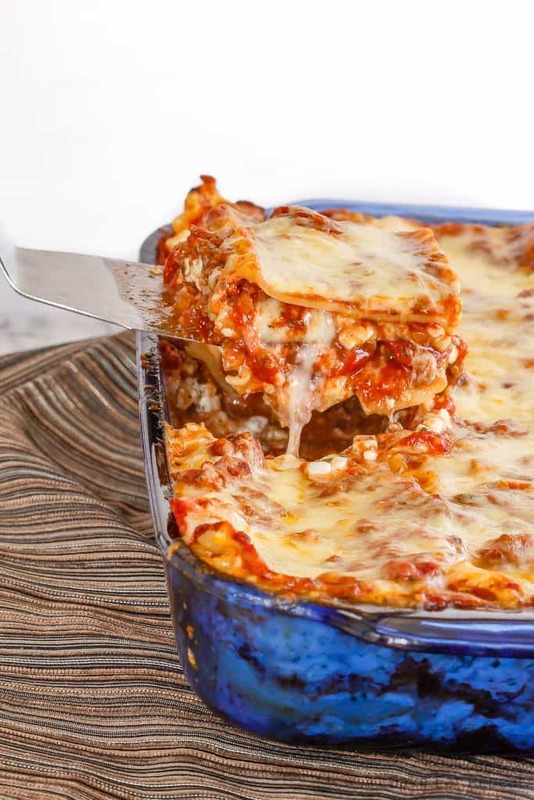 If you’ve never made homemade lasagna before, you should definitely try this recipe! It has been given rave reviews from everyone who tries it. It takes a little time to prepare, but it isn’t difficult – and is completely worth the time! 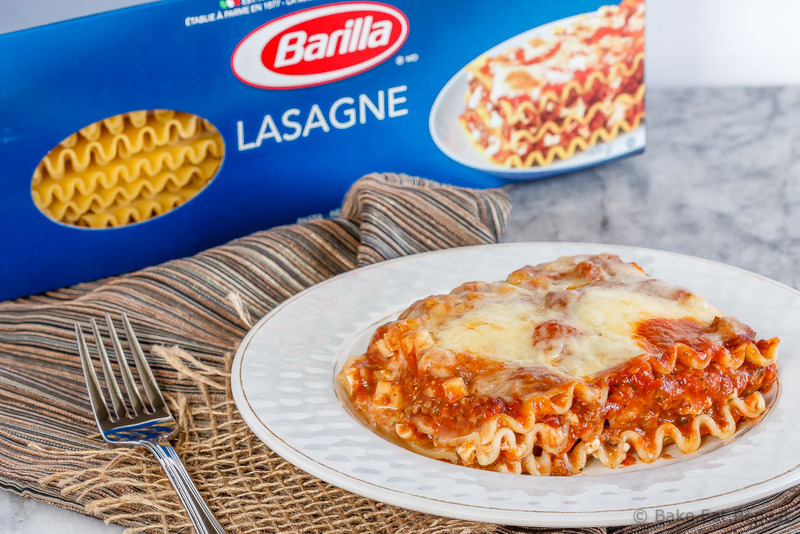 Celebrate World Pasta Day with me with some lasagna – or head to Barilla.ca to find many more pasta recipes you’ll love. If you want your meat sauce to be a bit smoother, you can use an immersion blender to break down the diced tomatoes or use crushed tomatoes instead. If you don’t like the texture of cottage cheese, you can make it smoother with an immersion blender. 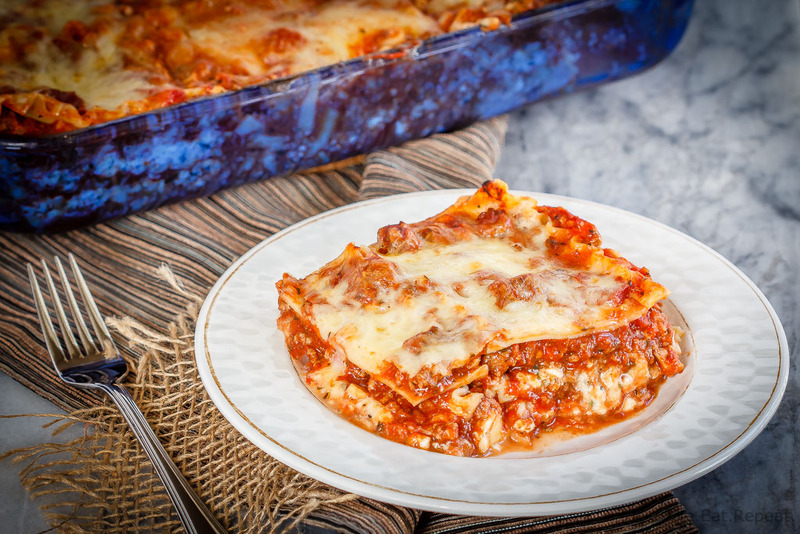 To freeze this lasagna, simply layer it in the pan as directed and then cover it tightly. When you’re ready to bake let it defrost in the refrigerator overnight and then bake as directed. If it’s still a bit frozen it may take a little more time. Just bake it until it is hot and bubbling. If the cheese is getting too browned, you can cover it with tin foil until it is finished. 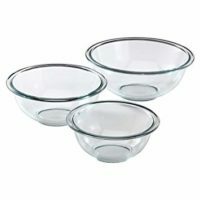 If you don’t want your baking dish staying in the freezer, you can line the dish with a double layer of aluminum foil before layering the ingredients in it. 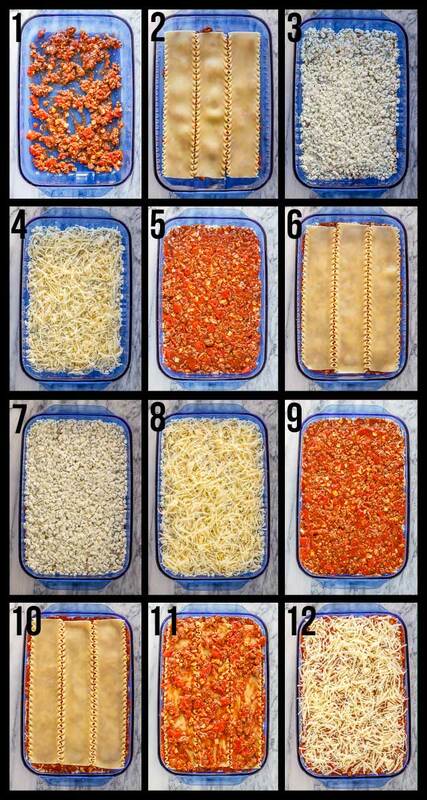 Once it’s frozen you can pop the frozen lasagna out to leave in the freezer. Remove the foil before placing it back in the dish to defrost and bake. Homemade lasagna is one of my family's favourite meals. A thick and chunky meat sauce and lots of cheese, layered with tender pasta - perfect comfort food! In a large saucepan, over medium heat, brown the ground beef. Drain off the fat, and then add the garlic, mushrooms, onion and basil to the pan. Cook, stirring, for 2-3 minutes until the onions are softened slightly. Add the tomatoes and tomato paste and stir to combine. Lower the heat and simmer, uncovered, for 30 minutes, stirring occasionally. In a large pot, boil the lasagna noodles until al dente, about 10 minutes (I use whole wheat noodles, the time may be a bit less for white noodles) and drain. In a large bowl, combine the cottage cheese, parmesan cheese, parsley, pepper, and beaten eggs. In a 9x13 inch baking pan, layer the lasagna. Place half the noodles in the pan and spread with half the cottage cheese mixture. Next spread one third of the mozzarella cheese and then half the meat sauce. Repeat these layers and then top with the remaining third of the mozzarella cheese. Bake at 375 degrees F for 30 minutes, or until the cheese has started to brown and the filling is hot and bubbling. Let it stand for at least 10 minutes to set up before cutting into squares and serving. This recipe is easily doubled if you need two pans, or want to freeze or gift one. 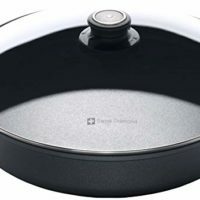 You can also make half a recipe and use an 8x8 inch pan. It can be made a day or two in advance and refrigerated before baking, or even frozen. If frozen, defrost in the refrigerator the day before baking, or if baking from frozen, increase the baking time by about 30 minutes and cover it with foil for the first half hour. Source: my mom! No idea where she originally got this recipe, it was on one of those handwritten recipe cards! Lasagna is always classic! A family favorite for sure! I love a good lasagna! I am going to have to try yours out! I love family passed down recipes! They are always the best and this one looks amazing! One of my all time favorite meals! 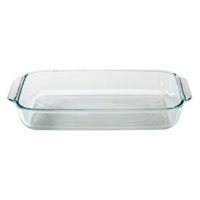 Love your tip about the foil lined baking dish for freezing! I love those pictures! This lasagna looks delicious! In our house, we always have lasagna for Christmas Eve - and it has to be Barilla pasta. Your recipe is a little different from mine. Saving this to try this year!